Since 2001, seedEnergy has been one of Australia's leading suppliers of genetically improved Eucalyptus globulus seed. seedEnergy is licensed to produce seed from the Southern Tree Breeding Association's (STBA) genetic material. 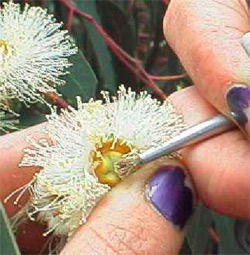 The Mass Supplementary Pollination technique (MSP) is a hand pollination method that was developed through a collaborative research project between seedEnergy, the University of Tasmanian and the Cooperative Research Centre for Sustainable Production Forestry. MSP is used to produce elite full-sib family seed for family forestry deployment. MSP seed is produced by cross pollinating parents with demonstrated superiority. The best parent combinations are chosen using the results from STBA's advanced-generation progeny trials to identify the top ranked families. This type of family selection capitalises on additive (general combining ability) and non-additive (specific combining ability) genetic effects. The MSP pollination technique yields additional gains by minimising the proportion of self-pollinated seed, which significantly reduces the level of inbreeding depression expressed in plantations. The Cambridge clonal Eucalyptus globulus orchard was established at Cambridge, Tasmanian in 2001. The orchard contains elite STBA breeding population selections. A rolling front strategy is used to incorporate new high-ranking STBA selections from advanced generation trials as they become available. The orchard is intensively managed to maximise flower bud production and seed set. seedEnergy harvests high quality open-pollinated Eucalyptus globulus seed from the Cambridge Clonal orchard. STBA's TREEPLAN® breeding values are used to select genetically superior trees for seed collection.